Tired of hanging your outdoor Christmas lights? Can't take one more year of climbing that ladder and risking your health for Christmas lights? Give up the Chevy Chase Christmas. 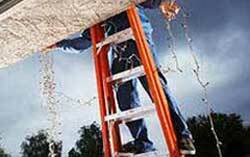 We can hang your Christmas lights while you enjoy the holiday season. We are here to help you design the best Christmas light display in your neighborhood. Make this year your happiest holidays. Call us for a free estimate today. Contact us today! Our professional staff will work with you to get just the design and look you want for Christmas. You won’t be falling off any ladders at the beginning or end of this holiday season! 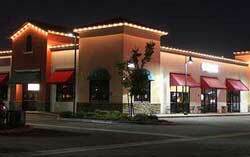 Commercial businesses can use holiday lighting to attract passersby. Vibrant Lighting will work with you to create your perfect holiday lighting display. 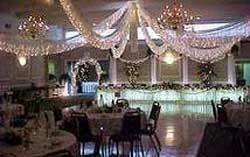 Do you have a special event such as a wedding or a party coming up soon? Work with a lighting specialist to create a beautiful lighting design. We have a simple three step plan that will help you with all your outdoor lighting needs, especially at Christmas time. Follow these three steps and your holidays will look a lot brighter! Request estimate or call 801-899-9627. Our professional staff will meet with you to design your outdoor lighting needs for the season. Our light installers will come out to your property, install the lighting and make sure all lights are working. If you have any issues during the season we will come out and fix the problem lights. 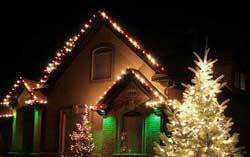 Enjoy your beautiful display worry free knowing our technicians will come out to your property and remove your holiday lighting. We store the lights for you to ensure everything is ready for next year. Why Choose Vibrant Lighting For Your Holiday Lighting? 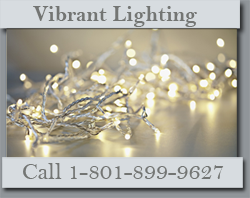 For more than four years, the outdoor light installation professionals at Vibrant Lighting, have been the best at decorating for Christmas, holidays and special events in the state of Utah. Our professional light installation crews are recognized in the industry as among the best. Our staff shows talent in planning, designing, installing lighting and are easy to work with as well as being very dependable. What makes our company stand out is that we have developed a client-friendly approach where we work with you to create a superior finished lighting design that enhances your unique home and property. Then we make sure that the integrity of the system works flawlessly. We have hundreds of satisfied customers because we took the time to listen to their individual needs and design ideas. Customers enjoy brilliant Christmas lights that outshine their neighbors and add a touch of beauty to their community. Please join our list of happy and satisfied customers today. Earn $20 for each person you refer that purchases a Christmas lighting package. Just ask us about it when you call.